Ohio's Fun Place to Race!! Friday October 12th is Open Practice for any division. Group Qualifying for Open Compacts, Mini Trucks, Midvale Street Stocks, Open Street Stocks, and Crate Modifieds. Halloween Costume Contest at Intermission THERE WILL BE A "TRACK OR TREAT" on Saturday at intermission!! There will be a costume contest....Drivers are asked to bring candy and decorate your cars for the kids!! 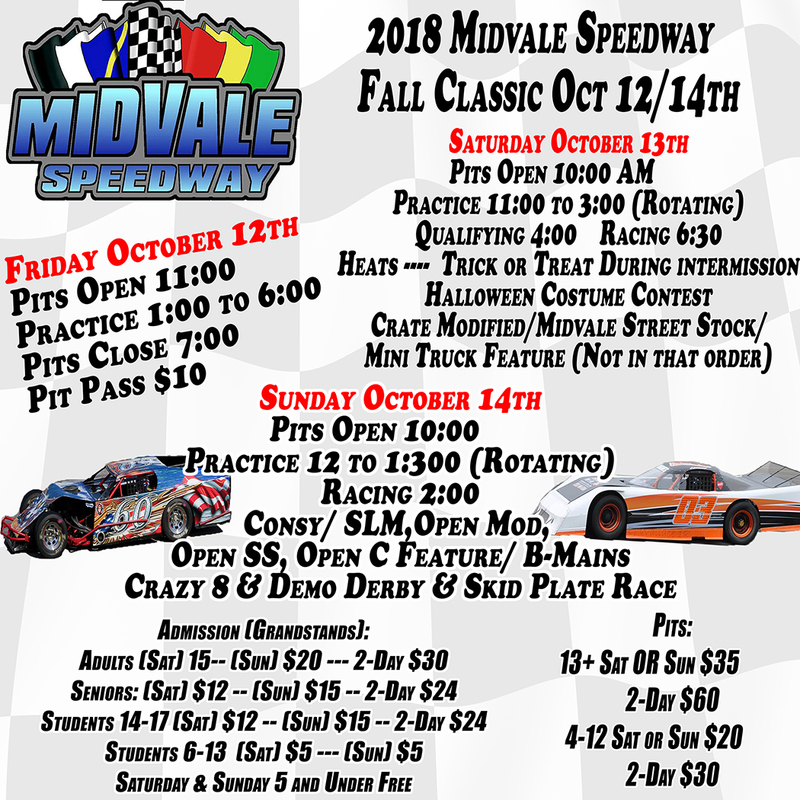 Features for Crate Modifieds, Midvale Street Stocks, and Mini Trucks. It will be regular feature laps! NO ENGINE FIRE TILL 12!! So.....as you can all see....there is A TON OF RACING AND ACTION FOR EVERYONE ALL WEEKEND LONG!! Adults $30, Seniors $24, Students 14-17 $24 Students 6-13 NEED to Buy each day! THANK YOU EVERYONE......LETS HAVE A MAJOR BASH TO END THE SEASON! !